​Optimist International Essay Contest - The Essay Contest is sponsored by Optimist International to give young people the opportunity to write about their own opinions regarding the world in which they live. The approach can encompass a young person’s personal experience, the experience of their country or a more historical perspective. In additional to developing skills for written expression, participants also have the opportunity to win a college scholarship. Optimist International assigns a new topic each year and provides the rules and guidelines for holding this essay contest for students. The Northridge Optimist Club club conducts a local level of the contest in conjunction with Northridge schools. The winning contestant’s essay is then eligible to compete for scholarship awards with other student essays at the Optimist District (state) level. Left to right: - Teacher Adina Dodds; Justin Koopman (Honorable Mention); JaQuayo Craver (Honorable Mention); Gavin Tipton (Second Place); Bayleigh Tipton (Honorable Mention); Matthew Quesnell (Honorable Mention); Adam Shinlever (Honorable Mention; Autumn Messer (First Place); not pictured - Jeremiah Carter (Second Place). 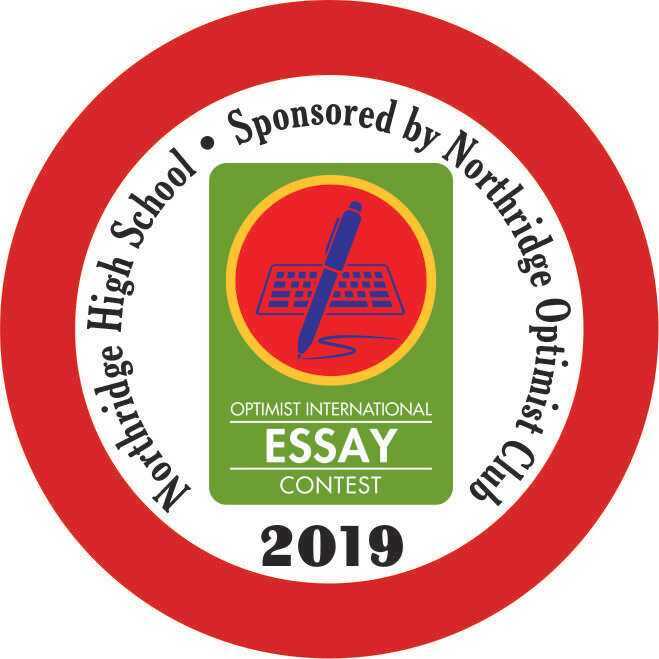 • Students in the Northridge High School ninth grade honors English class recently completed entries in the Optimist International Essay Contest, sponsored by Northridge Optimist Club. The topic of this year’s contest was “When All the World's Problems are Solved, is Optimism Still Necessary”. An awards meeting was held during a pizza luncheon at the high school on Tuesday, March 19 to recognize the finalists. ​• The first place award went to Autumn Messer, second place to Gavin Tipton, and third place to Jeremiah Carter (who was unable to attend the ceremony). They each received an Olympic style medallion (gold, silver and bronze), a certificate for their placing, an Essay Contest pin, an Optimist stylus pen, and a souvenir Optimist mug. Certificates were also presented for Honorable Mention for Justin Koopman, JaQuayo Craver, Bayleigh Tipton, Matthew Quesnell, and Adam Shinlever. Autumn's winning essay will now compete statewide with other winning student essays for a chance at a $2500 scholarship from Optimist International. A certificate of thanks and gift cards were also given to Ms. Dodds for her efforts in directing the contest and inspiring the students to create their excellent essays. • School Principal Craig Ewing, and Guidance Counselor Trish Engle also stopped in at the meeting. See more photos, including the individual contestants, in the slide show below. ﻿The members of the Northridge Optimist Club pass along their thanks to all of the students for their fine essays, to Northridge High School and staff for hosting the event, to the judges (Tina Rezash Rogal, Kristen Tomlinson, and David Williamson) for their significant efforts, and especially to Adina Dodds who put in a lot of extra effort on the project. The contest would not be possible without a dedicated teacher to direct the students, and her fine efforts are much appreciated. The past seven Northridge Optimist Club sponsored essay contests have been held for students in the ninth grade Honors English class. For next year, the 2020 contest is planned for the eleventh grade English class, and another teacher will take over. At this awards meeting, the club gave special thanks to teacher Adina Dodds, not only for this year, but for the previous six years of directing the contest for her ninth graders. We couldn't have done it without her.